Piranha Pedro (with a sombrero-are there piranhas in Mexico, I wonder???) sits on his little island and wants to leave it. Problem is: There are piranhas out there, and LOTS of water, which can only be overcome with stepping stones. Basically Piranha Pedro is like Sisyphos, as his journey from the island always ultimately ends in failure (= end of a round). Poor s.o.b.! 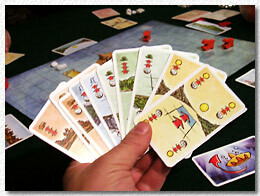 Each player has 12 cards with 1-3 stone symbols, 3 for West, North, South, East direction. They also have a pile of stepping stones in front of them (four at the beginning, more are less after each round depending on what cards you played). Each player plays his/her card secretly and after that, they are revealed in changing turn order. If a player played a 3 East card for example, Piranha Pedro would move 3 spaces in an eastern direction (actually N,W,S,E are shown as symbols corresponding to game board sides), if he passed water spaces the player playing the card would have to expand stepping stones. 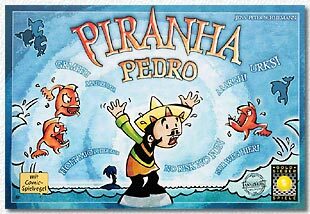 If the player runs out of them or if Piranha Pedro steps on the eponymous Piranha, the round is over and a new round begins. If the same player fails twice, the game ends immediately and ALL other players win, so this is a good game to build up your self-esteem after a long series of lost "St. Petersburg" games, for example. "Piranha Pedro" is a bit like a very simple "Robo Rallye" - you can never be sure what the other players are up to with poor ol' Pedro, and where exactly he is going to end up. The beginning spaces of the island are safe havens, and you might try to move Pedro around in circles a little to avoid spending stones. A beloved tactic is to unexpectedly move Pedro to the edge of the gameboard, because then the chance rises that one of the players accidentally moves him over the edge (another death for Pedro - I guess he drowns in a glass of wine or falls from the table). "Piranha Pedro" is lovingly crafted: The stepping stones are real pebbles, and Pedro stands proud as a little wooded figure. The rules are explained in comic book form, which is certainly an innovation (but not the first game to do so - see "Snit's Revenge"). It is a simple game with good player interaction, and it equally works when playing together with kids. One might get tired of Pedro's shenanigans after a while (because there is not really a lot to it), but as a quick break game this certainly serves its purpose.